page 53 note 1 Fouilles de Doura - Europus, 1922–1923 (cited here as Doura), p. 452.
page 53 note 2 Ann., XII, 13; second edition by H. F. Pelham and C. D. Fisher, 1907.
page 53 note 3 Les destinées de l'Hellénisme au delà de l'Euphrate, Mém. soc. nat. des antiquaires de France, LXIII, 1904, p. 274, n. 3.
page 53 note 4 Travels in Georgia, Persia, Armenia, etc., Vol. II (1822), p. 542.
page 53 note 5 For the references see Höfer, Sandas, in Roscher IV, col. 329.
page 53 note 6 Minns, E. H., J.H.S., XXXV, 1915, p. 22. No. I is dated 88 B.C. page 53 note 7 Cowley, A., J.R.A.S., 1919, p. 147; 12 (or 11) B.C. He reads Sinak in 1. 6, as against Justi, Iranisches Namenbuch, whom he cites as giving Sinakes for the same Pahlavi word. So Babylonian Arsak sometimes occurs instead the Babylonian forms, but never Arsakes: Clay, A. T., Babylonian records in the library of J. Pierpont Morgan II, 1913, p. 17.
page 53 note 8 Mansiones Parthicae, 11, 12, 15, 17.
page 54 note 1 Wroth, W., B.M. Coins, Parthia, p. 92, no. 202.
page 54 note 2 Ch. Clermont-Ganneau, , Rev. de Phist. des religions, LXXX, 1919, p. 1.
page 54 note 3 Wroth, op. cit., passim. page 54 note 4 Chapot, l.c., says the lettering shows an early date (in the Parthian period). But I doubt if he had seen Porter's copy, and he had not the Doura material in 1904.
page 54 note 5 See the map on the Routenkarte in Sarre and Herzfeld, Archäologische Reise im Euphratund Tigris-Gebiet, Vol. I. Few maps give it. page 55 note 1 Fr. 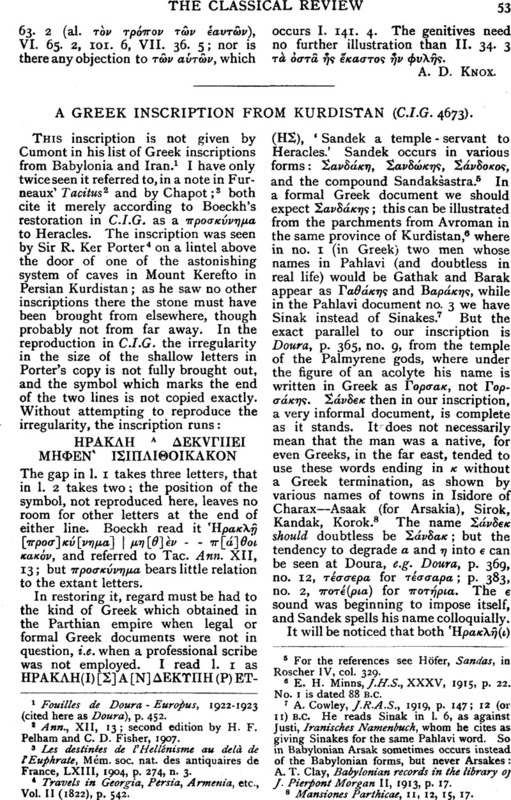 Thureau-Dangin, , Une relation de la huitiètine campagne de Sargon, 1912.
page 55 note 2 Furneaux' note ad loc. page 55 note 3 Herakles in P.W., Supp. Bd. III, 1918, col. 985.
page 55 note 4 See generally for all this, Höfer, Sandas, in Roscher, and Zwicker, Sandon, in P.W. page 55 note 5 Höfer, op. cit., col. 329.
page 55 note 6 Klio, IX, 1909, p. 362, no. 3.
page 55 note 7 Kulturgeschichte des Altertums, 1925, p. 100, n. 201.
page 55 note 8 Zeits. für Savigny-Stiftung, Röm. Abt., XLVI, 1926, p. 296, n. 4.
page 55 note 9 Doura, p. 452.
page 55 note 10 Kennedy, J., J.R.A.S., 1904, p. 309.